But how do you fertilize it? Where do I add it? Do I have to wear gloves? What if my kid accidentally drinks some? Suddenly you’re not so sure. Don’t worry. Just sit back for a minute and read about what, how, and when to mix into your system. Mixing hydroponic nutrients can be a breeze! If you haven’t’ already chosen a fertilizer, check out this post and video on choosing. Basically, there are two deciding factors: wet vs. dry, and what crops you’re going to be fertilizing. Don’t forget that different crops have different nutrient demands! If you’re a commercial grower, there’s a 99% chance that a dry fertilizer will be best for you. Commercial nutrient mixes also come in dozens of different ratios. I’m talking about nitrogen, phosphorous, and potassium—or NPK—which different plants require in different amounts. If you’re growing greens, you’ll want to use something different than if you’re growing, say, tomatoes. This will maximize plant health and help you get the best possible production out of your system. Which nutrients should I add? Different mixes give you different nutrients. Your crops will be claiming oxygen, hydrogen, and carbon from the water and air around them. For the most part, you don’t need to worry about those three. The rest of the primary nutrients are nitrogen, phosphorous, and potassium. Those will be provided in the NPK fertilizer you use. The secondary nutrients are calcium, magnesium, and sulfur. If you can’t tell by the name magnesium sulfate, magnesium and sulfur are supplemented in this compound—Epsom salt. From here you only have the micro-nutrients to deal with and unless you want to buy an expensive auto-dosing system, we suggest treating micro-nutrient deficiencies as they pop up. You can tell which nutrient deficiencies you might have by examining the symptoms. Quick tip: when you’re buying Epsom salt, be sure to check the ingredients list. If it has scent, dye, or perfume added, don’t buy it. When it comes to mixing nutrients, your familiarity with your system will play to your advantage. Most practitioners shoot for the sump or mixing tank because it has a crucial factor: turbulence. You want to give your nutrients both space and the turbulence to mix thoroughly. Choose the place in your system that will accomplish this best. 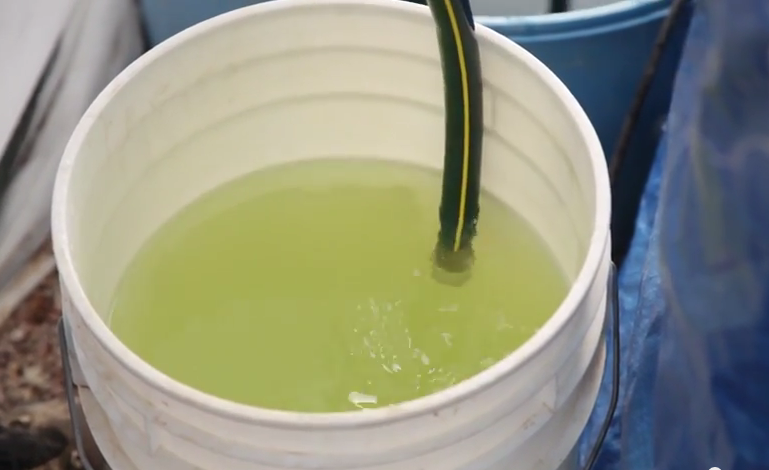 You can either mix each nutrient mix separately then combine the three or add them to your tank separately (but don’t combine the calcium nitrate with anything else when you’re mixing—it’s not compatible with the other parts of the solution). Check the label on the nutrient mix you are using and follow the instructions provided there. The amount of Epsom salt you add will also be formulated on the label of your nutrient mix. Check your nutrient levels daily. You will likely need to top off your system every few days, and add nutrients to compensate for both plant use and the dilution of the top off. a container to use on the scale. Additional buckets, stirring rods, and gloves are optional, but sure wouldn’t hurt to have around. You’re now ready to start mixing! So, how do you feel about dosing your system? As always, we hope this post was helpful, but if you’re still unclear on anything, don’t hesitate to leave a comment. hello there, your demonstration was pretty cool easy and go! my question is always i see some demonstration where they start to explain about checking ph of the water you add your solution. and again they check ph once the mix done. how about that, how do you normaly check the ph? Check the pH with a testing kit or a probe. See how it’s done: https://youtu.be/XygVBa1MJq8! and Epsom Salt for a 10L tank? For the vegetation gram per liter? For flow grams per liter? I built 2- 6 barrel containers for a ebb and flow system. I’m using rain water One unit is to be peppers and the other tomatoes. Can you tell me which mix I should use? Calcium nitrate should be mixed separately from the NPK. Once each has been mixed and diluted, the two can be combined. Where is the seven micro nutrients ? ?is it added in Npk as chelated form?? Micronutrients are typically included with a base NPK formula. Check the label of the one you use for the form and amounts of each. Can I add micronutrient in chelated form in Npk ?? I have a 1000 gallon tank. And masterblend formula. How much do i use in the nutrients, calcium nitrate and mag. sulphate. I have a lot of sediment from the nutrients on the bottom of the container. Am I adding too much? Should I add a water filter? Make sure to mix in hot water, and mix sulfates/phosphates separately from calcium nitrate. If the problem still persists, you can mix with RO filtered water, or just mix the solution to be slightly more dilute (this is assuming you are mixing stock solutions for an auto dosing system!). Hi Felix – Yep, that shouldn’t be a problem. You’d be mixing Magnesium sulfate, Calcium ammonium nitrate, and Magnesium nitrate together. They wouldn’t cause growing problems, but you will have to work with solubility a bit more. Are they any alternatives for Calcium instead of Calcium Nitrate to mix with Chem-gro’s formulas? How can I bring down the ratio of Nitrogen without losing the Calcium? Hi Keith, hydrated lime — Ca(OH)2 — can be used to supplement calcium. It’s basic, so it shouldn’t be used in a high-pH system. You can also try calcium chloride as a foliar application (research application before doing it). A third option is calcium chelate. Thank you for the reply. Calcium chelate is an interesting option and I think that will work. Thank you. hello, am in Tanzania, Africa. 15:9:20,+3.8s+1.8MgO+Te.YARA mila) Now wht ratio should measures to meet the formula for lettuce. Try using the hydrobuddy app, it has many popular formulas that are already calculated. You will just need to add info for the specific raw input you are able to obtain, and it will calculate how much to add. You can also add in nutrient levels from the label of any commercially available nutrient (if it isn’t already in the calculator), add info for your raw inputs, and it will calculate weights to replicate the formula. Hi Anup—you’ll definitely want to solve for controlling the climate inside your growing space, whether that’s shade cloth or a cooling wall, or something else!